Interactive children's books don't need to be enhanced by technology. Interactivity can simply mean the book creator has cleverly thought about how to engage kids and have them physically respond to a book. Such is certainly the case with the Follow the Line books. 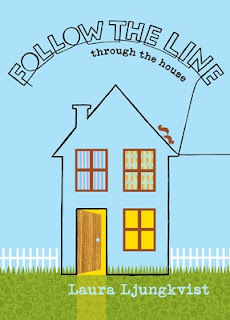 I can't imagine anyone, child or adult, who wouldn't be entranced by these three books: Follow the Line (2006), Follow the Line through the house (2007) and Follow the Line around the world (2008). 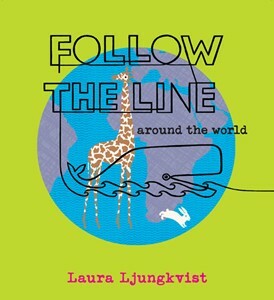 All are written and illustrated by Laura Ljungkvist and published by Puffin (Penguin). All are wonderful ways to introduce children to look carefully at the world around them, and to think of it in terms of art and design. Each book is based upon the premise of following a line as it takes a journey through the book, and through landscapes kids will recognise. The first interactive element then is tracing the line's continuous journey with a finger. This helps kids become more engaged with the detail in the shapes of objects themselves, and also become aware of the relationships between the positive and negative shapes. Great for developing fine motor co-ordination! 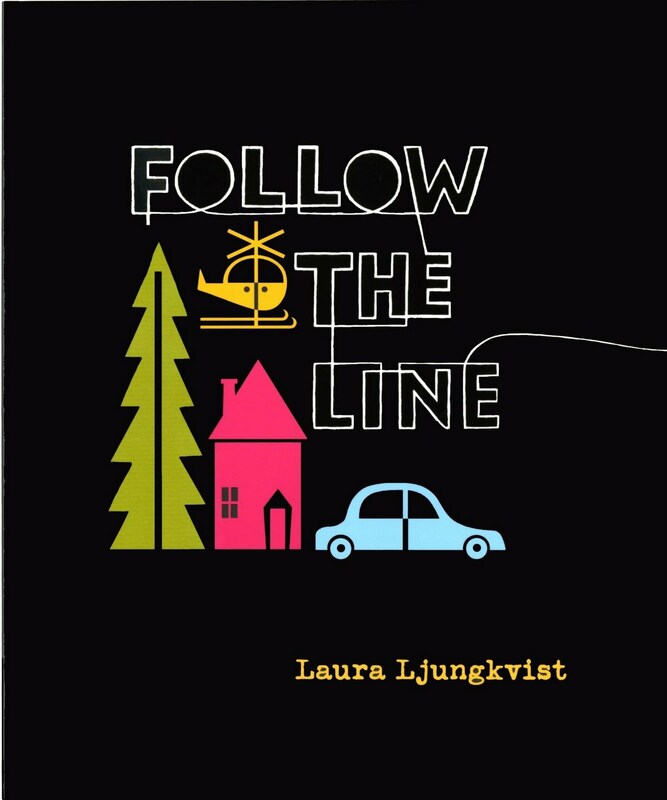 The line goes up and down, outlining shapes, flowing on from page to page, involving the reader in Ljungkvist's imagination. The next interactive element is looking and finding. In this aspect, it's like an I Spy book. Follow the Line and Follow the Line through the house emphasise counting and object recognition, asking questions that encourage kids to observe and respond with numbers, patterns, colours and and objects. In Follow the Line through the house, kids are asked "Which tools have wooden handles?" and "Can you find a ring that fell out of the jewelry box?" Whereas Follow the Line around the world, while still being based upon the line's journey, introduces fascinating little snippets of information about creatures in habitats around the world. For instance, in the Amazon Rainforest double page, we learn that "Parrots can live to be a hundred years old" and in the Antarctica pages we discover that "Penguins can't fly, but they are really good swimmers and can stay underwater for a long time." If your children enjoy non-fiction, or absorbing facts about our planet, Follow the Line around the world will grab their attention. I adore these books. As soon as I saw them I fell in love with Ljungkvist's style. Her choice of restricted colour on colour, the somehow intricate but clean and uncluttered retro look, the way she's used the line to teach us about design all make the books a visual delight. Don't take my word for it, look inside the books at Follow the Line website and at Penguin Books Australia. The Follow the Line books are a must for libraries. They make special gifts for kids of all ages, from toddlers who'll enjoy looking and listening, to preschoolers beginning to count, to primary-aged children who love art. I can see classroom teachers basing murals on the ideas in the books and predict children will translate what they learn within these pages to art work and drawings of their own. If you're planning a trip to a gallery of modern art with your young children, any Follow the Line book will make an excellent resource. Find more Children's Book Reviews on The Book Chook via the Table of Contents.